Swipe to the left and tap More to take record actions such as Web Login, Edit, View, and Delete. 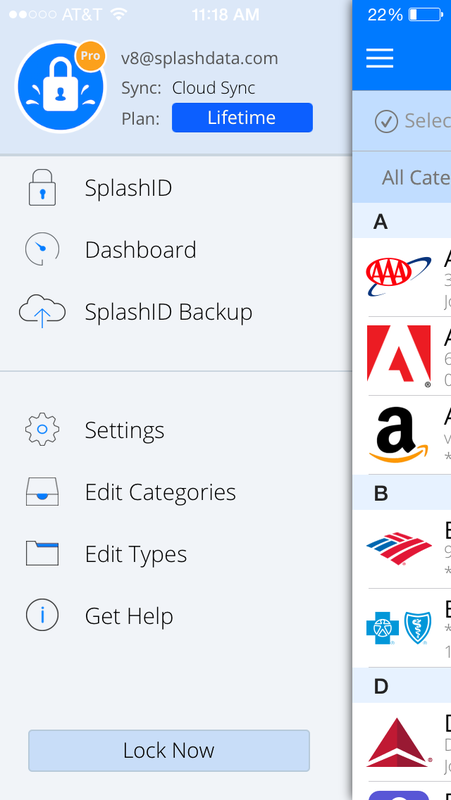 Side menu button - Access Dashboard, Backup, Settings, and Help. 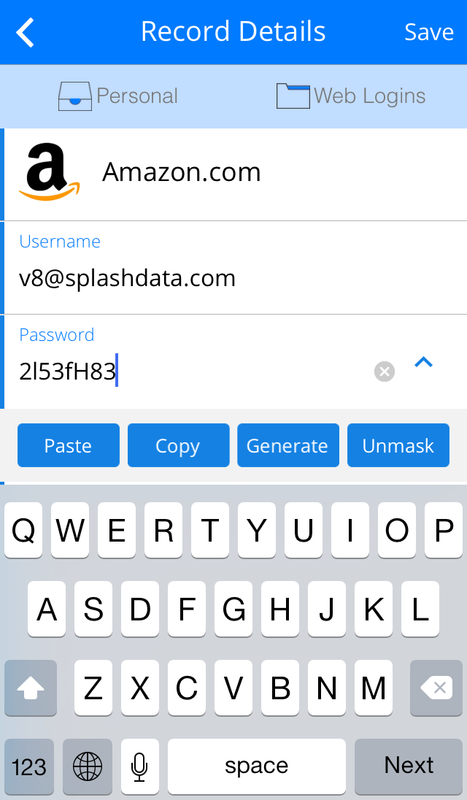 Tap a field to access tools, such as Edit, Copy, Generate (password), and Mask. You can set password generator settings in the main Settings screen. If you want to add additional fields, tap an existing field, then tap Edit, then you can enter data on the extra fields or add attachments. Tap the Login button next to field 1 if the record is a Web Login to open the browser and autofill the username and password. You can also turn on Auto-Submit in Settings. Make Local will designate any record in your SplashID database as Local only. This means the record stays local on the device and does not sync to the cloud server. 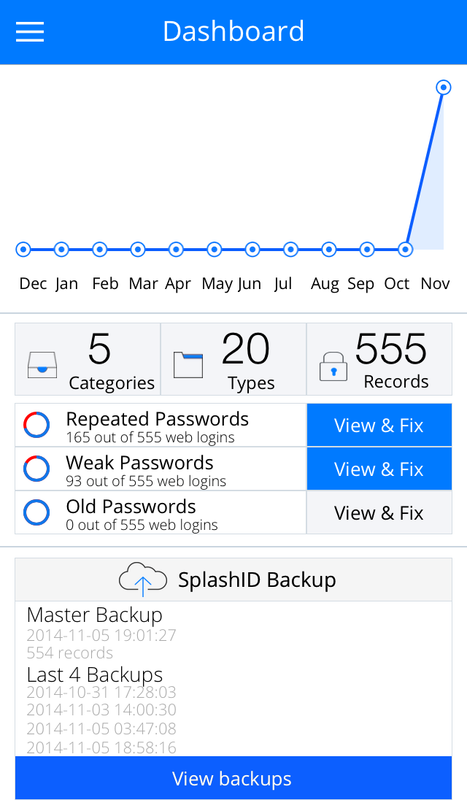 If the record is already on the web app or on any other devices running SplashID, it will get deleted from those apps. 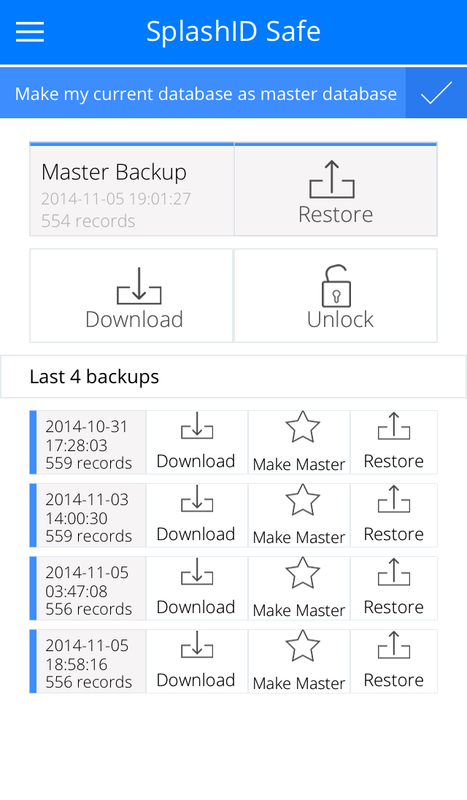 At any point, you can set the record back to sync with the cloud. The record would then sync back to the cloud server and appear on all devices. 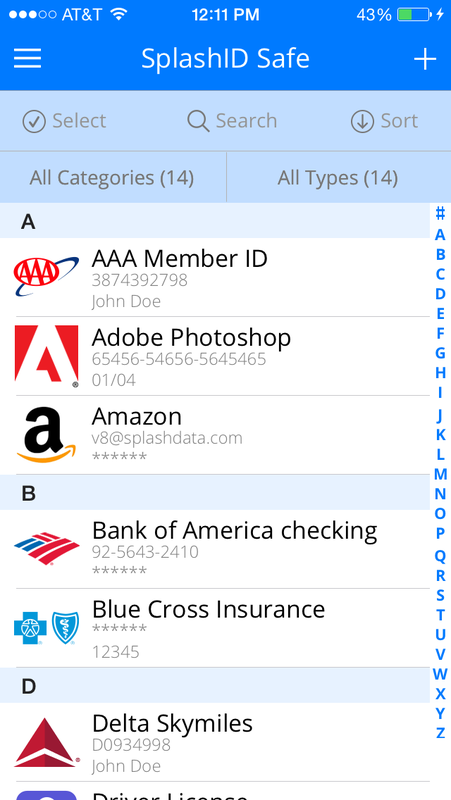 Tap the Category or Type menus to change the assigned category or type. 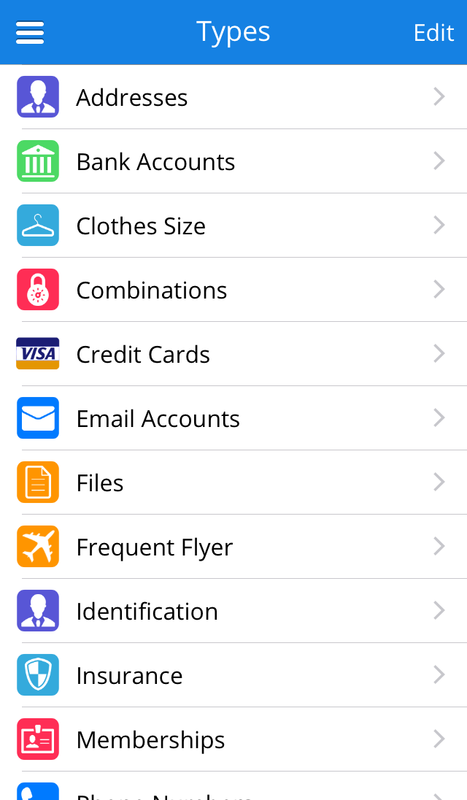 Tap the Icon to access the icon picker and make a new selection. This may not be necessary, however, as many logos are automatically assigned after you enter the record name. For example, type "Amazon" for the record name and the Amazon logo shows up when go to the next field or save. Tap the field in the data data space or the field label to edit directly. Tap the Add Attachment button to add a photo or document (up to 1 MB). Lock Now -- Locks and encrypts the SplashID database. Set Timeout -- Change your auto-locking timeout period: Immediately up to 30 minutes. Share Securely -- Use this tool to send multiple records or all of them as a secure file for SplashID users or a limited use self-destructing web page for non-SplashID users. Setting a Pattern -- A more fun and convenient way to login is using a pattern. To set a pattern, tap the Pattern button in the Set Password dialog. Then draw your pattern using the numbered dots supplied (no overlapping or repeating). Tap Continue and confirm the pattern, then make a note of the numeric equivalent - this must match the SplashID desktop if you plan on synchronizing. 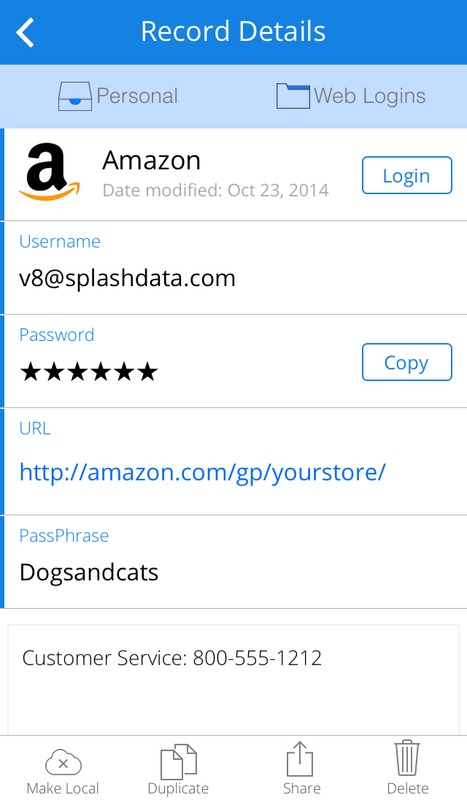 In version 6 of SplashID desktop, you can use a pattern to login as well.